I love promoting handmade, as well as doing crafts of my own. My favorite hobby is scrapbooking, which I've been doing since 1997. Sometimes I sit down ready to create a scrapbook page, but I have a creative block & can't think of a unique layout on my own. That's why I was so excited to discover Creative Scrappers when looking for inspiration online. 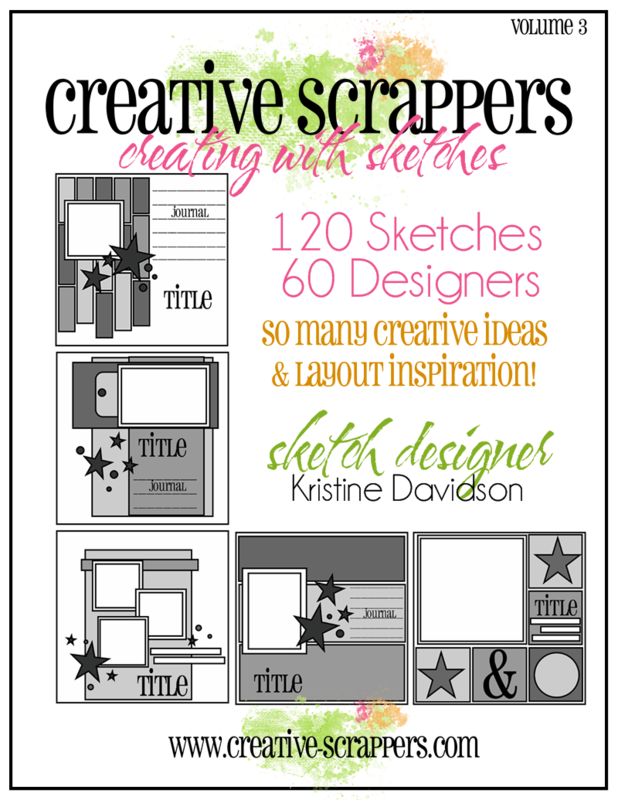 Kristine Davidson is the founder and coordinator of Creative Scrappers, a site started six years ago. Since then, the site has featured over 250 Sketch reveals! A few months ago, I saw that Kristine was preparing to release her third version of Creating With Sketches, a book featuring 120 never before posted sketches with examples from 60 international designers. She was also looking for scrapbookers who might be interested in creating a layout for publication based on one of the sketches, so I emailed her expressing my interest. I absolutely loved the sketch Kristine provided me with, so much so that I created a couple of different layouts! 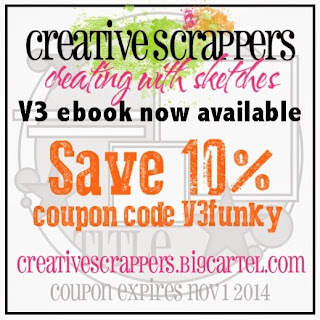 Creating With Sketches V3 is available in both digital and printed formats. The digital download is just $10.00 and the printed version is $18.00 plus shipping. Pre-order for the printed version is open until October 15th, so be sure to get your order in ASAP. 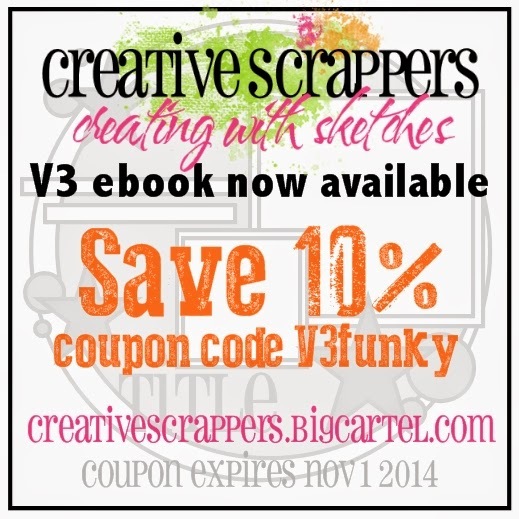 Receive a 10% Discount using coupon code V3funky at checkout! Expires November 1st, 2014. Click here to order. TO ENTER: Comment on this post. Be sure to leave your email address if it's not easily accessible through your profile. ADDITIONAL ENTRY: Like Creative Scrappers on Facebook & leave a comment noting that you have done so. Giveaway ends at 6pm CDT, Monday, November 3rd, 2014. Yes please! I'm starting to love sketches! would be cool to win! I like Creative scrappers on facebook! very fun, One can always have help with creativity. Thanks for the chance. Already a follower of Creative Scrappers. They rock! What a fun book. I can't wait to see it! Thanks for the chance to win!! I absolutely love working with sketches. I feel much more productive than I would trying to come up with something on my own. I liked your FB page. Thanks for the giveaway! Thanks for the great giveaway. This book would really help me with scrapbooking! Very cool giveaway! I need all the inspiration I can get with layout designs and ideas! Thanks so much! Please enter me in the giveaway! Love the Sketches!! !